I always admired musicians and their magical talents. I would look at a piece of sheet music or hymnal and marvel at the beautiful characters that made up a written representation of sound. I couldn't read music so it seemed simultaneously beautiful, complex and intimidating. When I married my husband twenty five years ago, he had two pianos. One was an upright, the other a mid-size grand. He had begun music lessons in his forties while living in Alberta, Canada as an expatriate. He loved his lessons. Eventually, his company transferred him and his family back to Chicago. Several months later, tragedy struck and his then wife of twenty years suddenly died of inoperable Glioblastoma. Somehow, the will to learn piano was lost in the fog of grief. A year later we met by chance. We became phone pals and pen pals as PCs were not yet part of society and we were dating long distance. I in San Francisco and he in Chicago..
We fell in love and were married. I moved to Chicago. We lived in an eighty year old home. I knew nothing about pianos, but I learned. My first lesson was selling the upright and learning how an upright piano must be moved down stairs and into a waiting truck. My second lesson was learning what to do for the Grand to keep it in good condition. It was sad to me that I couldn't play and that Randal no longer had the desire; nonetheless, the piano just seemed to fit our home. I wanted to keep it and so did he. Over the years I had the piano tuned and consistently cared for it. We moved -a lot. I learned how to have the keys blocked prior to the arrival of the moving company. I learned how movers take the legs off of a grand piano in preparation for loading it onto a semi trailer; and I learned the process in reverse when we arrived at our new locations. Homes were chosen based on whether they could accommodate the piano. Neither of us played. Tuners always commented on what a beautiful instrument we had and they truly enjoyed playing it. They also were amazed that it rarely needed much tuning. It was December. I was cleaning house. As I dusted the piano I wondered if I could ever learn to play. I thought about it for days. Eventually I added 'Learn to Play Piano' to my New Year's Resolution list. Because I take my resolutions seriously, I started teaching myself to play on January first. I could barely find middle C, I couldn't read music. I struggled. I was at a church retreat, visiting with my minister and the leader of the retreat, also a minister, at lunch. The subject of music came up. 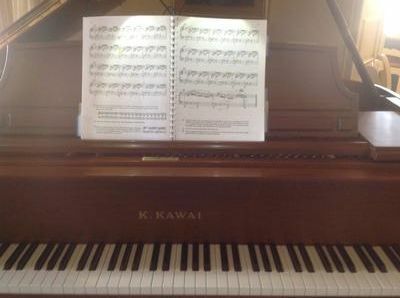 Shyly, I admitted that I was trying to teach myself to play piano. I also hesitantly admitted it had taken me TWENTY YEARS (!) to work up the courage. I was an artist, a seamstress, a crafter, a baker a cook, a reader, a wife. I was a lot of things but I was NOT a musician. Jim, the retreat leader, told me his wife was a piano instructor with 49 years experience. She had a few openings. Was I interested. I enthusiastically said yes. We exchanged numbers. By the time I got home, my shyness returned and I decided I couldn't make the call. I'm fifty years old, I thought. My husband is sixty nine. I'm not sure a piano teacher wants someone my age. I continued to struggle on my own with my "How to Teach Yourself to Play Piano" book. A few weeks later the phone rang. When I answered a sweet southern voice introduced herself. She explained her husband had given her my name and she was wondering if I wanted to start lessons. She was putting her fall schedule together. Most of her students were either in school or home schooled and therefore, if I was interested in lessons, I would need to get onto her schedule. I asked a few questions and explained I wanted to discuss it with my husband. I promised to call back later that evening. Randal was very supportive of the idea and enthusiastically encouraged me to try lessons. I called back and said I would like to sign up. I spent the next several days fretting that I was an artist who painted watercolors and was NOT a musician. What was I thinking when I said yes to piano lessons? At my inaugural lesson, I explained all of my deficiencies as a music student; the list was long. My sweet teacher listened and said not to worry - her job was to overcome such problems. She presented me with a brand new book of music and we began. I was nervous. Very nervous. The lesson was fun. I went home and spent the week practicing. The book she had given me had twenty pages of short little tunes, all in the key of C. Since that was the only key I could sort of read music in I was happy. Ignorance is bliss. I thought my job was to learn every song in the book before my next lesson. I worked hard and practiced long hours. The following Monday, I explained I learned every song but couldn't play very fast. My teacher was amazed I had worked so hard. I was amazed I could practice twenty to twenty five hours a week. Time flew by when I was at the piano. I LOVED learning and playing........I couldn't get enough. I have now been taking lessons for two and a half years. I continue to practice an average of twenty to twenty five hours a week. Piano has become such a part of me that I truly can't imagine life without it. I am more surprised than anyone that I have become a pianist. I never had the chance to learn music as a child. I can honestly say, I wish I would have started learning piano at age three. In any event, I am learning now and love it. I still work my way cover to cover through every book I am assigned and feel I have found myself through music. I am blessed in so many ways...........and I know it. I'm so glad that you put your beautiful piece of furniture to good use. You have overcome you shyness quite well and enjoy your new found passion. No longer is your piano gathering dust; it's feeding your creative soul. Thank you for that beautiful story! What a moving and beautiful story! So encouraging for others to start playing. You writing style is very beautiful as well...!